Until 1950 the term teenagers had never before been coined. Children were known as girls and boys were known as youths once they displayed signs of puberty. Then young people were grown up at 18 and fully adult legally at 21 when they often married and set up a home of their own, even if it was a rented room. Getting married was a way of showing the adult world that you belonged to their world and was a way of escape from puberty. During the 1950s a range of influences including film, television, magazines and the rock music scene created a new market grouping called teenagers. Teens made themselves known. A sudden flurry of consumer goods denied to war torn Europe were available and a consumer boom was actively encouraged. These single young people with cash from paid work soon had their own fashions, own music, own cafes, own milk bars and by the end of the decade even their own transport in the form of fuelled scooters. Teenagers suddenly dominated style in clothes, haircuts and even travel abroad. A generation gap began to emerge between parents and teen offspring. It seemed almost unholy at the time and was viewed as rebellious, but compared to later anti-fashion and anarchic movements it was all rather innocent. American influence on European teenagers was huge. Rock and Roll idols including Elvis Presley, Bill Hayley, Jerry Lee Lewis and film stars James Dean and Marlon Brando set fashions almost unwittingly. 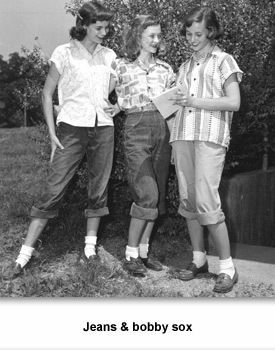 The main looks for teenagers were greasers and preppies. Greasers followed the standard black leather and denim jeans look set by Marlon Brando in "The Wild One" (1953) and later emulated in the 1978 film called "Grease". They raced about town on motorbikes and were consider outrageous. Preppie qualities were neatness, tidiness and grooming. Teen girls wore full dirndl or circular skirts with large appliqués on their clothing. 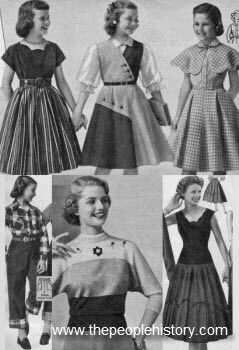 Neat pleated skirts were also popular. The pleated skirts were made from a then new fabric called TERYLENE (polyester) which helped maintain razor sharp sunray pleating. 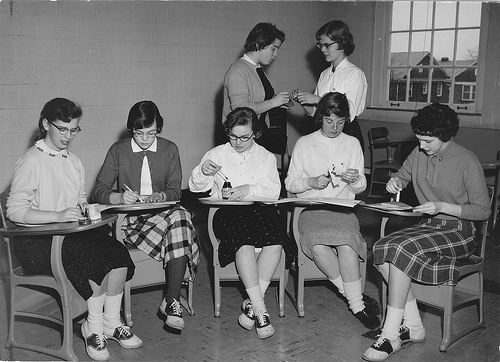 The skirts were supported by bouffant paper nylon or net petticoats. On top, teens wore scoop neck blouses, back to front cardigans, tight polo necks or three quarter sleeve white fitting shirts often with a scarf knotted cowboy fashion at the side neck. These teen clothing fashions that originated in America, filtered to Britain in watered down fashion. 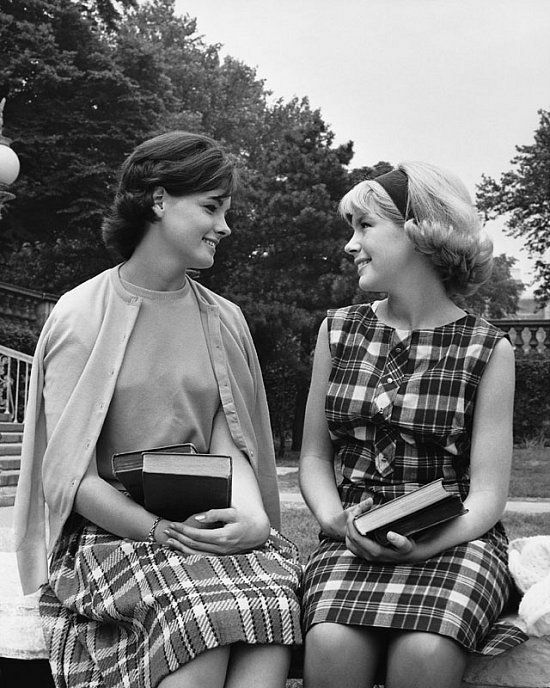 Old Photos of Typical Late 1950's Teenagers. 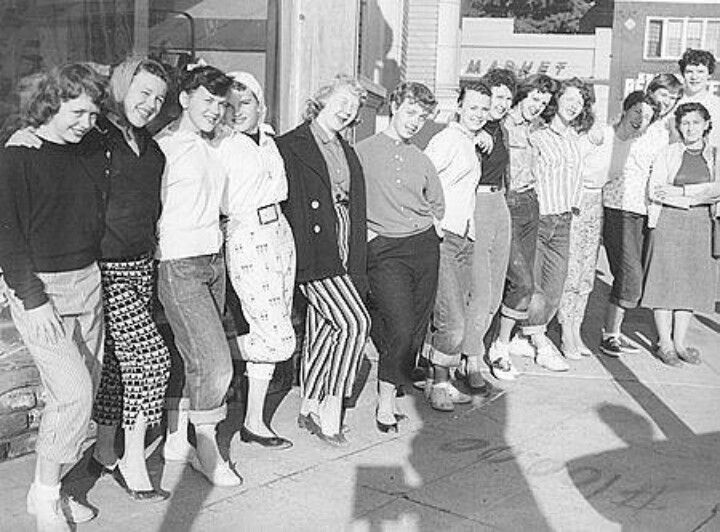 Typical teenagers of the 1950s wearing general fashions of the day. Nothing too extreme, but very much in fashion with a fair bit of grooming evident. Note the wonderful layers of net petticoats under Vera's skirt. These male teens are wearing standard male fashions of the day with token attention to small fashion details such as the narrower tie. The teen boy on the left has suede shoes. It's important to remember that more conventional young men wore this type of clothing than teddy boy gear. Men still did national service and this had an effect of a 'uniform' mentality approach to dress of wearing pressed, neat clean clothing. The BBC states 'Between 1945 and 1963, 2.5 million young men were compelled to do their time in National Service - with 6,000 being called up every fortnight.' This basic blazer or jacket look was favoured by the majority of youths and is fairly conventional but was in that era thought quite sharp. 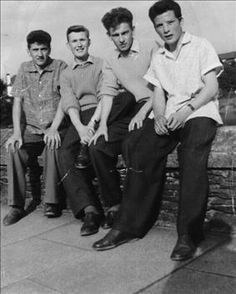 Growing up in the 1950s I recall far more young teen men dressed like those in the picture above, than as the 'typical teddy boy look' so often used as an image of the 50s. My thanks to Vera for the use of these images. As the site is about female dress my interest in developing male dress entries is very limited. Even though this site does not really deal with male dress, the Teddy Boy was an important look in fashion history of the 1950s. 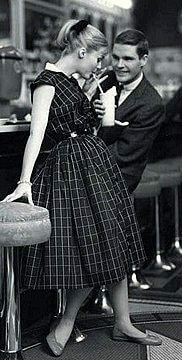 As an extreme look it is remembered and all conventional looks of the day tend to be overlooked. It is worth remembering that when costume history documents a look it is almost ways in retrospect and hones in on the final extremes of any look. A site visitor recently wrote to tell me that he felt the teddy boy style originated in the forties by spivs and was then taken up by teenagers in the very early 50's. He maintains that the Teddy Boy clothes of the early fifties would not be recognised as a Teddy Boy by most people today. So here are a few points below on the memorable extremes of the teddy boy look. It is known that in England, a group of young men who rejected the shabby, but functional clothes styles worn by their fathers began to long for elegant fashions. From around 1949 this was expressed as a liking for Edwardian style velvet trimmed skirted coats and specific accessories. This fashion is thought to have really originated when 500 Jamaicans arrived in Tilbury in 1948 on board the ex troop ship "Empire Windrush" in response to the UK's government plea to the Caribbean for workers. They wore Zoot suits and the Edwardian look is thought to have been an adaptation of the suit the Jamaicans were seen wearing about the East End towns. Until 1951 the Edwardian look suits were custom made. In August 1951 reports state that the Edwardian look was gaining support in America. By November 1951 the Edwardian look had percolated to the UK factory tailoring trade as a new trend. By 1952 in London's East End this fashion was taken on by semi skilled adolescents formed groups, who lurked in cafes and hung around street corners. The self imposed uniform that gave them group identity was that of the Teddy Boy. 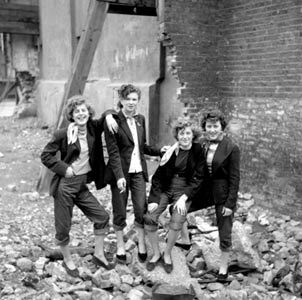 Even though some groups were violent, many who wore Teddy Boy clothes were not. They simply wished to break away from the conforming clothes of the day. Traditionally Teddy Boys or Neo-Edwardians sported the "Drape" a long knee length, single breasted wool jacket with narrow contrasting lapels and cuffs either of velvet or satin and plenty of pockets. They wore contrast or matching narrow drainpipe trousers, brocade waistcoats, stiff shirts and shoestring ties or bootlace slim Jim ties topped off with suede shoes. Teds also wore crepe soled shoes which helped with the dance movements of jiving. Teddy Boy clothes were not cheap to buy and when custom tailored, usually cost up to £100 for one outfit. An ordinary mass produced drape suit cost approximately £20 and shoes £3. So sporting a new suit indicated to peers how well an individual was doing money wise. At this time a Teddy Boy would have earned between £5 and £12 a week. A site visitor has written to tell me some fifties facts - The 'Crape' sole shoes originated during the second world war and looked nothing like the Brothel Creepers seen in the 50's, George Cox the company who first made the Brothel Creeper is still in business and making the Creeper. The boys slicked back their hair with Brilliantine into a wavy Quiff style with long sideburns and because of the way the hair was finished to the back of the head, the style was brushed back to meet in the middle with the finishing touch of a comb run down the centre back ,thus giving the look of a DA (ducks arse). The most common Hair cut was called a Tony Curtis taken from the way he wore his hair. Lots of Teddy Boys had Bikes in the fifties, the rocker style was born from the Teds who wore Drapes at weekends but leathers on the bike, by the early 60's Rockers were a major style. A trip to the Ace Cafe in London is well worth a visit to learn about Rockers. (Thanks to Chris for input on these few paragraphs). The fashion for Teddy Boy clothes spread across the world, even to the USSR. In the USA teen fashion fads were paralleled by youths who wore leather jackets instead of a drape, sometimes leather trousers, but often jeans, all accessorized with a shiny motorbike. The film West Side Story captures this era perfectly as does the later retrospective film Grease. 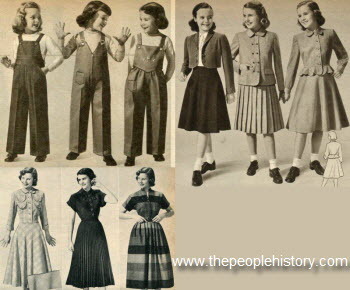 These skirt pattern images are courtesy of anothertimevintageapparel and are typical of the full skirts worn by teddy girls for rock n'roll or jiving. The pony tailed girlfriends of Teds wore eye make up and took every fashion to excess. Their favourite outfit was a close fitted black sweater and calf length skirt, or toreador pants or circle skirts with low cut tops all perfect to display the body when dancing. By 1956 the Teddy Boy movement was on the wane in the UK and by 1958 was fading rapidly as teenagers fixed on new fashions influenced by American pop and cinema culture and a nod to the Italians. Dudes were another kind of dandy who were American in origin. They wore spanking clean white socks, white buckskin shoes, 5 buttoned jackets, trousers with top waist pleats and turn ups. The outfits were often enlivened with coloured bead belts or jazzy patterned hats, with for example polka dots. An exaggerated version of this was favoured by Little Richard. As the trend for a beatnik look developed, oversized chunky long sweaters with huge cowl collars were worn over slim fitting pencil skirts or slacks with stirrups. The girls usually had a French pleat hairstyle or showed the start of a beehive. Wearing all black was a favourite choice for beatniks. As a new, more liberated society evolved, teenagers became a marketing man's dream. 1950's teenagers had comparatively huge spending power compared to pre 1950 youth. Their spending power enabled them to make self indulgent purchases, sometimes with even more freedom than adults. The teenagers were keen to find special clothes designed just for teens. Eager to capture this extra cash, manufacturers began to look toward the teenage market concentrating on younger desires rather than the desires of the middle aged and elder populations. Ironically as the population once again ages in the noughties, marketers have begun to focus on the very same generation that held influence over the economy in the 1950s and 1960s.